Have you ever seen something in a couple of different verses, and missed putting the two together? I had that happen this week, and I felt God breathing on it. When I feel that, I try to take it seriously, even if the thing he’s breathing on isn’t exegetically pristine. 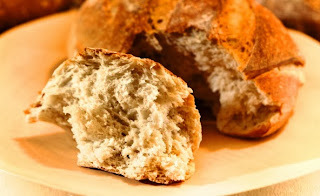 Read that again: the enemies of the fulfillment of the promise of God are our bread. Our nourishment. Provision for us. This reminds me of something Father said to me one time when I was asking him to take these kind of enemies away from me: “Son, how do you ever expect to become an overcomer if you never have anything to overcome?” May I be honest? That wasn’t actually comforting to me at the time. ♦ I’ve misunderstood the enemies and obstacles to the fulfillment of God’s promises. I’ve thought of them as evil, bad, nasty things. It sounds like they’re something I should embrace: my nourishment, my provision, the stepping stones into the promise. ♦ There’s a connection between these enemies and obstacles, and the provision that Jesus specifically instructs me to pray for. Seriously? Am I supposed to pray for these? Well, if the Book is true (consider Matthew 5:44) Now I’m not convinced that he’s necessarily saying, “Pray that enemies come into your life” when he commands “Pray for your enemies,” but I don’t think I can stretch it to “Pray that you’d never have enemies” either. ♦ Can I be honest? Learning how to receive nourishment from bread is easy. Learning how to receive nourishment from enemies is more difficult. It might be, though, more important. Father is not, I’m convinced, all that excited about us having enemies to overcome. I’m convinced that he’s far more interested in the “overcoming” part than he is about the difficulties of handling the enemies. I’m convinced that part of the reason that overcoming is interesting to him is that it brings plunder into the Kingdom. It also rubs the enemy’s nose in God’s victory in us. That’s cool too. But the enemies in your way, the obstacles between you and your promises, those are your bread. Learn to feast on them.